Awning Service | Kreider's Canvas Service, Inc.
Spring is a time to clean away the winter mess and get ready for outdoor living. When our trucks begin to move through the local neighborhood folks begin to get excited because they know warm weather is on the way. A patio covered by a Kreider’s canopy is a happy patio!! 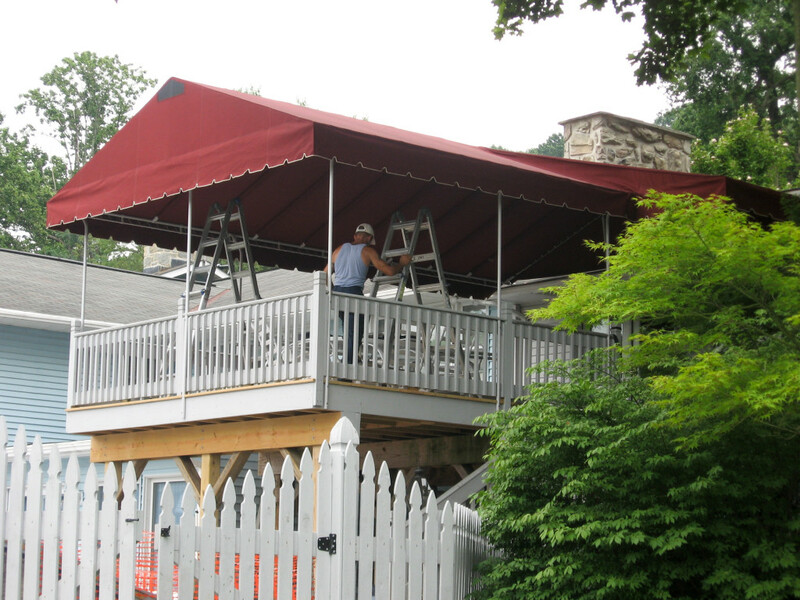 Kreider’s prides itself on providing you with top notch service for your awning and or canopy. You will find us to be friendly, helpful and on-time. Awnings and canopies that we service are guaranteed to have a drum tight fit with as few wrinkles as possible. Awnings that are installed properly will last longer because they will not “pool” water or flap so much in the wind. Care will be given to avoid stepping on flowers, railings or outdoor furniture. Our teams strives to leave your home looking better than when they came! Please call as soon as possible to schedule your spring rehang! For the most efficient and worry free service experience ask to be added to the Auto list. We generally try to have the rehangs completed between April 15th and Memorial Day. As summer wraps up and kids go back to school and the leaves start to showcase their beauty our teams gear up for the fall takedown season. To give your awning the longest lifespan possible it should be taken down prior to any snow and ice accumulation. Typically when the days grow shorter and cooler you will be excited to have the extra light and warmth flooding in through your windows. An awning or canopy that is removed by Kreider’s will be carefully inspected for holes, tears or other issues that may need attention. Should you choose to have your awning stored by us, it will be tagged and warehoused within our clean, dry & rodent free storage facility. Please call as soon as possible to schedule your fall takedown! We generally try to have the bulk of takedowns completed with-in the month of October. ROOF MOUNTED CANOPIES: instructions are the same except along the wall. Simply attach the roof mount brackets instead of the wall tabs as shown in the video. You would need a taller ladder to reach over the canopy roll to reach the roof mount brackets. ROOF MOUNTED CANOPIES: instructions are the same except along the wall. After loosening all lacing and velcro, bunch canopy up towards roof so you can reach over it to loosen the roof mount brackets and release the head-rod. Then after replacing headrod back into roof brackets for winter storage, slide the front of the canopy back down to the front corners and fold as seen in video. Thank you so much for your services to install our awning. We are truly enjoying it almost daily. It sure has added class to our home. Our patio enclosure is 10-12 degrees (maybe more) cooler than before. We will highly recommend your company to anyone who asks. With your help we have decided to stay in our home now rather than sell it.